New World Design Builders bring more than 25 years of experience to their work. President Chris Kofitsas leads the firm, a full-service company offering interior architecture and construction services. Architectural Digest, The Daily Beast, DuJour Magazine, and The New York Times have covered the New World Design Builders restaurants that have become celebrity favorites — in New York and Los Angeles. Also active in the spa industry, New World Design Builders focuses on the health and wellness of clients and guests. Streamlined communication means a smoother production process, and the use of natural materials creates calming environments. The strategy is working for Kofitsas’ team; look for New World Design Builders projects on top restaurant lists from Business Insider, Fodor’s Travel, AM New York, and Vogue. ABC Kitchen — the New American restaurant helmed by chef Jean-Georges Vongerichten — has become a New York favorite due in part to its unique location. The Michelin-starred eatery drawing attention from The New York Times, GQ, New York Magazine, and Vogue is inside of ABC Carpet & Home, a Gramercy Park, high-end decor retailer. In deference to the farm-to-table, sustainable menu options, the dining room is dressed in natural wood floors and exposed beams. Raw, concrete columns are softened by moody lighting and wood, natural-edge table tops. The James Beard Foundation named ABC Kitchen the Best New Restaurant of 2011. Across town is Toro NYC, a 120-seat restaurant bringing the flavors of Barcelona to Chelsea. The design plays up the former factory setting. To warm the steel beams, concrete floors, and exposed ductwork, the design also brings in a textured wall of wood panels and 18-foot windows that allow in natural light and city views. Jennifer Carpenter, a Leadership in Energy and Environmental Design (LEED AP), established her eponymous architecture and interior design firm in 2010, after earning a Master of Architecture from Columbia University and obtaining a bachelor’s degree from Yale. Jennifer Carpenter Architect has since earned awards from Confindustria Ceramica and the Boston Preservation Alliance. Also a co-founder of furniture and product design house Truck, Carpenter has designed pieces sold in luxury and museum design retailers. The New York Times, Interior Design, and Architectural Products magazine have featured the firm’s culinary designs, and they are the exclusive architecture design partners for HoneyGrow, a health-food chain that just opened its first New York location in Downtown Brooklyn. On the list of Jennifer Carpenter Architect clients, you’ll find more than one celebrity chef. Just before closing the doors to beloved hotspot WD-50, Chef Wylie Dufresne partnered with the firm to create Alder. In the spirit of Dufresne’s whimsical cuisine, the design for the East Village restaurant employs materials in unexpected ways. Wood reclaimed from the chef’s farmhouse now serves as a textured ceiling above the dining room. The tabletops — enough to seat 64 — are wrapped in bronze and fitted with rubber inlays where an ordinary placemat would lie. Uptown, the firm worked with internationally acclaimed chef Marcus Samuelsson to breathe new life into new classic Red Rooster. The Harlem restaurant remained open while the pass was replaced with a copper and worn-wood, rustic frame for the elevated soul food menu. The first floor dining room was also upgraded throughout, with new finishes and communal furniture pieces that enhance the restaurant’s joyful atmosphere. Crème founder and Principal Jun Aizaki relocated from Japan to New York City in the early 1990s before earning a degree from Pratt Institute School of Architecture. In 2004, after a few years working with formidable firm Rockwell Group and earning an IHMRS Gold Key Award for Best Restaurant Design, Aizaki established Crème, now a critically acclaimed, international design firm. Hospitality Design magazine honored the Williamsburg, Brooklyn-based business with a Wave of the Future Award. Crème has received similar attention from The New Yorker, Interior Design, Architectural Digest, New York Magazine, Food & Wine, and other notable outlets. Crème won the Prix Versailles in the restaurant category for the interior of L’Amico, an eatery in the Eventi Hotel in Chelsea. The 1,700-square-foot space combines rustic and industrial details. Wood fire ovens, clad in copper, stand next to built-in, geometric shelving used to store firewood. The rest of the open kitchen is dressed in simple black and white tile that nods at the graphic, concrete floors of the dining room. Floor-to-ceiling folding wall panels open the interior to the sidewalk, where diners sit in deep, oversized banquettes or blackened-steel and walnut chairs designed by the firm. Le Promenade des Anglais is the result of Chef Alain Allegretti’s collaboration with Crème — an elegant setting that taps into Allegretti’s connections with Southern France. The design is transportive, from the deep blue velour of the banquettes to the graphic ceiling. Brass light fixtures, antique mirrors, and a marble-topped bar punctuate the brasserie’s moody decor. AvroKO conceptualizes and designs some of the most progressive dining spaces in New York City and beyond. Partners and Principals Greg Bradshaw, Adam Farmerie, William Harris, and Kristina O’Neal established the firm in 2001 after meeting in college. Since establishing offices in Manhattan, San Francisco, London, and Bangkok, the firm of 120 creatives has designed everything from interiors to uniforms that have drawn the attention of the James Beard Foundation, Condé Nast Traveler, Interior Design, New York Magazine, and more. AvroKO is the architect and developer behind Saxon + Parole, one of Esquire magazine’s Best Bars in America and the Tales of the Cocktail Best Restaurant and Bar. The East Village restaurant is styled with a modernist equine theme, taking inspiration from New York City history; the namesake horses were winning local races at the turn of the century when horse stables were a common sight in lower Manhattan. A finalist for the Hospitality Design award for Best Fine Dining Design, Saxon + Parole utilizes everyday items in unusual ways. One installation wall juts into the space with knives sourced by the owners and brought in by customers. Built-in storage stacked with horse blankets are an acoustic dampener and add contrasting texture to finishes like reclaimed wood, exposed brick, and a wall dotted with close to 60,000 hand-hammered tacks. A few blocks away, on the Lower East Side, Beauty & Essex has emerged as another AvroKO darling of the downtown restaurant scene. Formerly the storefront of furniture shop Katz & Sons, the restaurant is a 250-seat jewel box hidden behind a functioning pawnshop. Haute Living named the 10k-square-foot restaurant one of New York’s hottest, citing the glamorous flourishes throughout the three-story space. In one room, dark, sumptuous banquettes sit under a tin ceiling draped with crystal, while in another, herringbone tile floors and textured, graphic wall panels glow under a convex skylight. Cass Calder Smith founded CCS Architecture in 1990. The team of 30 designers and principals now operates out of one office situated between the trendsetting neighborhoods of Greenwich Village and SoHo, and another in San Francisco. With partners Taylor Lawson, Barbara Vickroy, and Melissa Werner, Smith has led the firm to critical acclaim in the pages of Dwell, Architectural Record, The New York Times, and Metropolis. CCS Architecture has also earned recognition for their restaurant designs from James Beard, AIA Los Angeles, and the International Interior Design Association. CCS Architecture brought the charm of a quintessential Upper East Side locale downtown with designs for Sarabeth’s Park Avenue South. In this renovation, a former steakhouse became the 16k-square-foot outpost — now the largest of Sarabeth’s restaurants — with three private dining rooms, a patio for al fresco dining, and a large, refurbished bar. In total, the new Sarabeth’s can seat nearly 400 guests at completely new tables and banquettes across its main and lower level. The restaurant is finished in contrasting colors and varying textures, from walls wrapped in black tile and bleached wood panels, to floors tiled in varied geometric patterns. CCS Architecture also designed Covina, an elevated casual dining experience in NoMad. 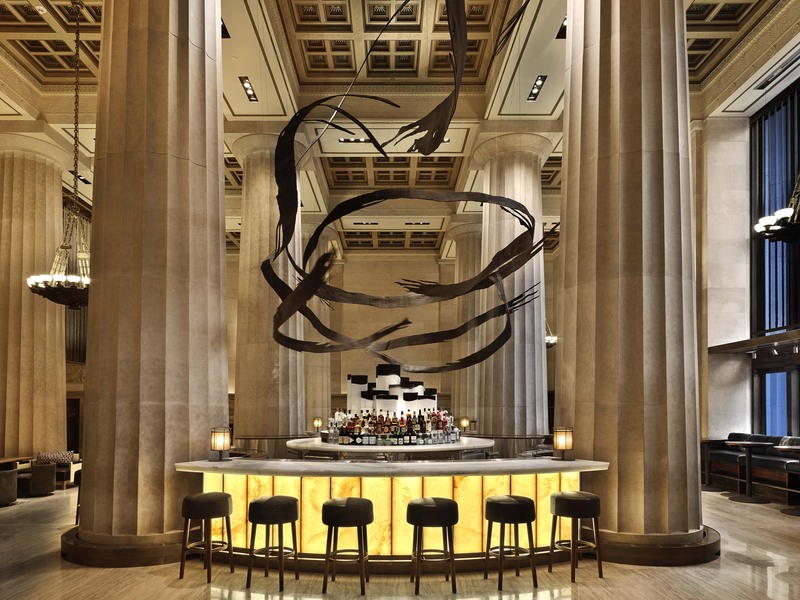 In partnership with Chef Tim Cushman and his wife Nancy, CCS Architecture created an environment that draws Park South Hotel guests and Manhattanites alike. Warm light and natural finishes forge a welcome oasis from the bustle of the city. A zinc-topped bar is tucked into a cozy alcove, warmed by exposed brick and wide plank wood floors. Guest sitting for a full meal may prefer the semi-private dining room, or a seat at the chef’s counter, looking into the open kitchen with its custom-tiled pizza oven and wood-fired grill. Wid Chapman Architects has completed projects across the US, as well as in the Dominican Republic, Malaysia, and other countries around the world. Founder Chapman, member of the American Institute of Architects (AIA), studied architecture at the Rhode Island School of Design and went on to chair the interior design program at Parsons School of Design. Since establishing the firm in 2003, Chapman has become an authority in lifestyle design, with projects featured in Hospitality Design, New York Magazine, Interior Design, The New York Times, and more. The firm’s work has also appeared in international publications distributed in Japan and India. The Wid Chapman-designed Industry Kitchen is in an unusual spot. This social media-ready bar and restaurant occupies 3,200 square feet under the FDR drive, the freeway that runs along Manhattan’s eastern waterfront. The location — in a larger structure designed by SHoP Architects — does have its perks. Architectural Digest and Wall Street Journal have noted the restaurant’s innovative design. Floor-to-ceiling windows just yards from the water’s edge give diners panoramic views of boats, bridges, and Queens. The design draws from the view; green tile evokes the flowing river, while concrete and iron recall the Brooklyn Bridge and, of course, the city’s skylines. A wood-paneled ceiling and natural wood table- and bar-tops mediate the effect of the more industrial finishes. Up the block, on SHoP Architects-designed Pier 15, you’ll find Watermark Bar. This Chapman project is a bit larger, with 3,500 square feet of indoor and outdoor space for up to 200 guests to enjoy a cocktail after exploring the South Street Seaport. The restrained design centers on a large bar wrapped in black subway tiles and topped with reclaimed wood. Metal finishes and globe light fixtures hint at old New York without competing with the view. Brothers Evan and Oliver Haslegrave are the co-founders of Home Studios, the Greenpoint, Brooklyn design firm behind New York City’s newest hotspots. Under Oliver’s direction, the small firm has captured the attention of Wall Street Journal, The New York Times, Wallpaper, Surface, and New York Magazine for projects across the United States. Since the company incorporated in 2009, Home Studios projects have consistently landed on top restaurant design lists from Eater and Dwell magazine. Home Studios projects have also been shortlisted for multiple Restaurant Bar & Design Awards and took home the prize for Tørst, named best-designed bar in North and South America. Home Studios designed Cherry Izakaya, the Japanese gastropub Dwell magazine called one of 10 Best-Designed Restaurants in America. The retro Tokyo design complements the Williamsburg, Brooklyn milieu. The large bar is dressed in handmade tiles, while the upstairs dining room is awash in reclaimed wood. Brass banker lamps and patinaed mirrors diffuse a warm glow, bolstered by the glow of recessed fixtures in the vaulted, wood-paneled ceiling. June in Cobble Hill has another artfully appointed interior by Home Studios. The existing wine bar, owned by Tom Kearney, was completely overhauled and given a vintage Paris-inspired palette of deep blues and soft grays. Vogue, Refinery29, Travel + Leisure & Food & Wine, have taken note of the immersive aesthetic. The marble-topped bar — opposite red, wood banquettes, and textured walls — dances with light from the frosted bulb light fixtures that run along the ceiling’s rounded vault. The space is rich, sophisticated, and unpretentious. Will Meyer and Gray Davis partnered in 1999 to establish Meyer Davis, a boutique design firm creating high-end residential, commercial, and corporate spaces. Meyer, once a protégé of the late, famed architect Charles Gwathmey, has established a reputation for expertly relating modern and traditional modes. Davis has spent more than 20 years in the industry and previously worked with designers Thomas O’Brien and John Saladino. The Meyer Davis team of over 40 designers operates out of offices in New York, London, and Los Angeles. Among the firm’s elite chef clientele are Daniel Boulud, Ford Fry, Tom Colicchio, and Jean-Georges Vongerichten. Meyer Davis restaurant designs have garnered awards and accolades from Interior Design, Boutique Design, Hospitality Design, and the International Hotel & Property Awards. A Meyer Davis collaboration with Reveal Design Group produced Harlow — the epitome of Hollywood glamour right in Midtown East. The marble oyster bar gleams under ornate chandeliers and a mirrored back bar. The main dining room, which retained its 1930s stained glass windows, seats 100. But before guests get to their tables, they come to a sumptuous parlor room to grab a drink at the white, leather bar lounge in plush seats beneath a high ceiling. The conservatory room is behind an interior wall draped in vines. Downtown, Meyer Davis is trendsetting with Boqueria. The SoHo restaurant and shop offers Spanish fare in a textural paradise. Ceiling panels hand-wrapped in burlap underscore a market aesthetic — a nod to the namesake Boqueria Market in Barcelona — while the thick, marble countertops along the bar and open kitchen steep the experience in luxury and quality. A sole proprietorship, Richard H. Lewis operates out of two offices on Manhattan’s Upper West Side. Since 1982, Lewis has created hospitality spaces that establish trends and galvanize paradigms of New York high-end dining world. Interior Design, The New York Times, New York Magazine, and The New York Post are among the publications taking notice of Lewis projects, which range from successful newcomers — like The Meatball Shop and French bistro Cherche Midi — to iconic New York destinations, like Tavern on the Green. The firm also designs luxury retail locations, workspaces, and private residences. The original Tavern on the Green opened in 1934 and evolved into a destination within Manhattan’s Central Park. In 2009, however, the restaurant closed amid scandal and bankruptcy. Five years after closing, the paragon of fine dining has been revived. The renovation required New York City to invest $20M into gutting the original and replacing the 1880, stone roof that had originally sheltered sheep who roamed the adjacent meadow. The new owners put another $18M into updating the building and restoring the facade. Lewis brought luster to the 350-seat dining rooms with gold leaf mirrors; red, tufted-velvet banquettes; and Victorian Gothic features. Diners can also sit outside in the bucolic yet contemporary courtyard, which earned a Lumen Award of Merit. In another Richard H. Lewis Architect transformation, what was once a barber shop tucked into a corner of Grand Central Terminal has become Agern, a Nordic eatery that offers respite from the city’s bustle. With designers Christina Meyer Bengtsson and Ulrik Nordentoft, Lewis brought Scandinavian charm and a spa aesthetic to the windowless, subterranean space. The 2,900-square-foot dining room is finished in pale woods and geometric tile. The chevron pattern nods at the Art Deco style of the nearby Chrysler building. David Rockwell, a Fellow of the American Institute of Architects (FAIA), founded Rockwell Group in Manhattan in 1984. Now, under the care of Rockwell and partners Greg Keffer and Shawn Sullivan, the firm employs a team of 250 designers and staff. From their offices in New York, Shanghai, and Madrid, Rockwell Group produces designs for projects in hospitality, healthcare, retail, and more. The firm, a James Beard Foundation Who’s Who of Food & Beverage inductee, has earned the National Design Award from the Cooper-Hewitt National Design Museum, the AIA New York President’s Award, among other prestigious architecture honors. Condé Nast Traveler, Food & Wine, and Fast Company rank Rockwell Group and their work among the most innovative and hottest in the industry. Having developed a 23-year relationship with Chef Nobu Matsuhisa — one that began with the restaurant’s Tribeca location — the firm is now the design collaborator for Nobu’s locations worldwide. The Rockwell Group design for Nobu Downtown, in the Financial District, won an NYCxDesign Award in the Restaurant/Bar category. The new, 4,500-square-foot restaurant is located in the former AT&T building. Immense, Botticino marble columns rise around the perimeter and through the center of the ground floor dining room. Another traditional feature, a coffered ceiling, gives way to a wooden canopy, pieced together with undulating wood beams and designed to resemble origami. Tao, another icon of the New York restaurant scene, also looked to Rockwell Group to design their Lower Manhattan outpost. Tao Downtown occupies the former home of the Maritime Hotel in Chelsea. Eschewing the typical dining format, the team created a dynamic, two-story layout that moves guests through various lounge areas spread across the 22k-square-foot space. Twenty-foot statues, a grand staircase, and carved pillars add drama and scale to the experience.